Craggy Correctional Center is located in Asheville North Carolina. 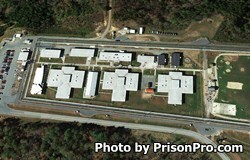 It is a medium security prison that houses 408 adult males. After the closing of Buncombe Correctional Center, Craggy Correctional Center also started to house minimum custody offenders. Inmates are housed in one of three dormitories and are secured by an electronic detection system that alerts to perimeter breaches. Minimum custody inmates are allowed to work in the Correctional Enterprise laundry program, and in additional job placements including on road crews, landscaping, culinary services, and custodial and building maintenance. Craggy Correctional Center offers inmates an alcohol and substance abuse treatment program called "A New Direction". A New Direction is a 28 day intensive treatment program, that offers counseling and group therapy. Vocational training is also offered and teaches the inmate a new skill. Additionally, education courses allow inmate's to earn a GED. Craggy Correctional Center utilizes a rotating visiting schedule based upon the first letter of the inmates last name, because of this you must call and get the current rotation. Visiting occurs on Sundays from 8:30am-10:30am, 12:30pm-2:30pm, and 3pm-5pm.